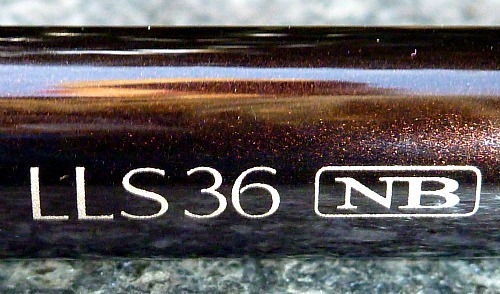 The Shimano LLS36 NB and LLS33 NB are Shimano's entry level tenkara rods. When I asked Dr. Ishigaki about the rods before I purchased one, he explained that the main difference between these rods and the Shimano LLS36 NX is in the cosmetics. Although they may not be quite as nice, they are still very handsome rods and if you didn't have the NX model to compare them to, you would never think it was cosmetically inferior to anything. The more expensive NX model has a very nice olive finish, while the less expensive NB model is a deep brown with very minute bright flecks in the finish. Bright flecks in the deep brown finish. There are two other differences that to my mind are a little more important. The grip has a slightly different shape, with the forward half of the grip on the Shimano LLS36 NB and LLS33 NB rods tapering gradually. In contrast, the grip on the NX rods has the two distinct gripping areas (the "humps" that led to it's "camel grip" nickname). The other difference is that the Shimano LLS36 NB and LLS33 NB are 7% glass while the NX is 1.2% glass. The larger percentage of glass explains the weight difference, with the NB weighing 2.6 ounces compared to 2.5 for the NX (for the 3.6m-length rods). Still, they are light rods. By way of comparison, the Tenkara USA 12' Iwana weighs 2.7 ounces. When fishing, though, the two Shimano rods really feel pretty similar. 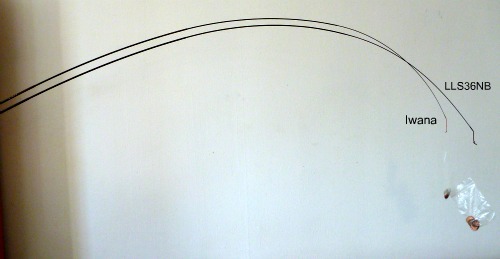 Unfortunately, I don't have a photo comparing the bends of the two Shimano rods. In any event, it may be more relevant to US anglers to compare the NB to the Tenkara USA Iwana, which is the rod that with which they are much more likely to be familiar. Shimano does not label their rods by the 5:5, 6:4, 7:3 convention. The NX model comes in a soft "S" or hard "H" action. The NB only comes in the soft action. I would say the LLS36 NB and NX models are both 6:4. Comparing the Shimano with the Iwana, the main difference between the bend characteristics, and the main difference that you can feel when fishing, is that the Shimano has a stiffer tip section. The reason it is a bit stiffer is that it is hollow. All the Shimano tenkara rods have hollow tips. Similarly, all the Daiwa rods that are designed for level lines have hollow tips. In fact, the "LL" in the name is the designation for level line. The solid tip, used in all the rods from every other manufacturer I can t hink of, is designed for rods intended for use with both level and tapered lines. 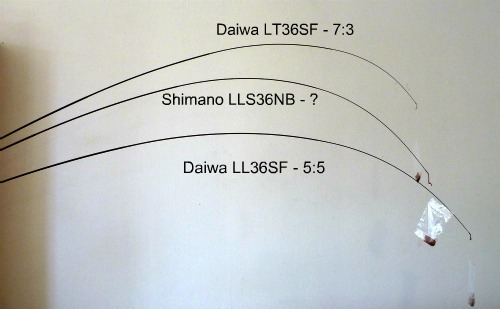 Difference between solid (Iwana) and hollow (LLS36 NB) tips. One practical effect of the hollow tip is that you can cast a much tighter loop, or rather, it is much easier to make a precise, tight loop cast. I have not fished a tapered line on the Shimano LLS36 NB. I did on the NX and found that I greatly preferred a size 4 level line with that rod. I generally fish a size 3 line on the NB, but only because the lighter line is a bit easier to hold off the water's surface and that is the line I usually fish. I suspect the 3.5 might be a better match. The difference between the solid tip and the slightly stiffer hollow tip seems like it should be noticeable in the feel of very delicate strikes, but I really don't recall feeling a difference because I react to visual clues for a strike and most are never felt anyway. In playing a fish, the feel is different for only the smallest of fish. Similarly, the slightly stiffer tip seems like it might be a bit better for fishing deep nymphs since there is a little less "give" when trying to set the hook. The rods are pretty clearly designed for fishing unweighted flies, though. With a sakasa kebari, the rod just feels "right." With a beadhead nymph, it just doesn't. I don't know why it doesn't, but it doesn't. In any event, if I was going to concentrate on nymph fishing, there are other rods that are much better suited to it than these. A modest fish puts a nice bend in the rod. When playing a fish of this size, you won't be thinking of the hollow vs. solid tip and you won't feel the difference. As with the Shimano LLS36 NX, and for that matter, all the Japanese tenkara rods that I know of other than Shimano's new Pack Tenkara, there is no hard case provided with the rod. Apparently, collapsing the rod into the grip section has proven over the years to be protection enough. I like the Shimano NB rods, although I like the NX rods a little better. The NX is a little nicer rod with the lighter weight and the camel grip. But then, it's a much more expensive rod. The LLS33 NB is really a very nice choice for someone who wants a light tenkara rod with a crisper feel and slightly more precise casting. Even as Shimano's entry level rod, it would be a nice upgrade from the rods that are more widely available here in the US. Both rods are out of stock. I suspect that the Shimano NB and NX series will be discontinued soon, as Shimano now has a full range of new rods, the Pack Tenkara, Keiryhu Tenkara and Honryu Tenkara. If you want one, I would suggest ordering one soon. They won't be around forever. Payment is through PayPal but you don't have to have a PayPal account. You can pay with your credit card. Domestic shipping is $8 via USPS priority mail (2-3 day delivery). The shipping charge will be added to your order automatically. International shipping requires an additional $6 to Canada or $11 to other countries for the rod alone. The charge is not added automatically and if you do not add it when you place your order, the order will be delayed and the charge will be slightly higher. 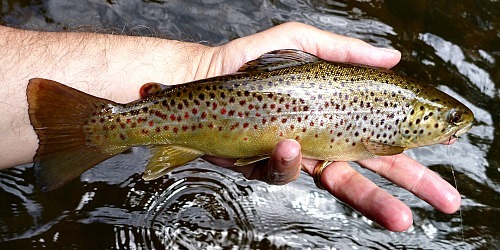 I finally got out with my Tenkara rod for 15 minutes on a small section of the Norwalk river. I am very happy to report that I was rewarded by a 12" rainbow after 4 casts. Very fun!! I am now officially addicted. Thanks for introducing me to a new way of fly fishing.